I know there are people who don’t like spicy food or are allergic to chili even. 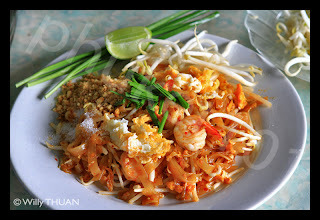 Not all Thai food is made spicy you just have to know which one to avoid. If you’re allergic to chili and you want to stress that out, you might say Chan Pae Prik, I’m allergic to chili. Steer clear of the any menu having the word Yum in it. Yum means spicy salad with three S: sour, salty, spicy. Tom Yum is also the case. Almost all curry paste which is the base for Thai curry, including Masaman, Green Curry, Panaeng, is made from chili. Some restaurants geared for foreigners, usually found in heavily touristic area, will have the non-chili version. Don’t risk it if you really can’t take chili. 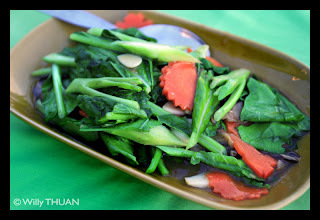 Pad Phak or stir-fried vegetable dishes usually has no chili. 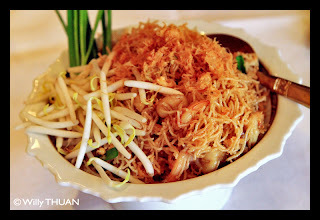 Some restaurants, especially local shops in Southern Thailand, might add one or two chili to Pad Phak Boong, stir-fried morning glory, or Phad Tua Ngawk. Say Mai Sai Prik as above.